English literature was discovered by Russia’s educated circles in the 18th century, although mainly in German and French translation; soon after the Patriotic War of 1812 there emerged a keen interest not only in British writers, but in the English language as well. The great Russian poet Mikhail Lermontov (1814-1841) was profoundly influenced by English literature. 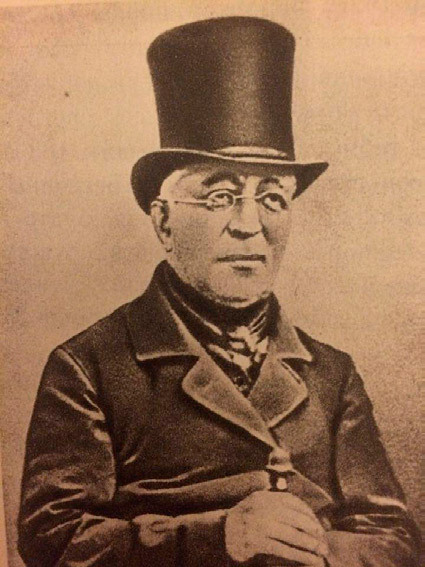 He started English lessons in 1829 while studying at Moscow University’s privileged boarding school, to which Yelizaveta Arsenieva, the grandmother of the future poet, had sent him. There students studied law, theology, mathematics, physics, geography, natural science, military matters, painting, music, dancing and the ancient languages; an interest in literature was especially encouraged. Among the boarding school’s graduates were such outstanding writers and poets as Vasily Zhukovsky, Alexander Griboyedov and Fyodor Tyutchev. From his early childhood, Lermontov could speak German and French, and later his grandmother hired as governor Mr. Windson, a Russianized Englishman who would be called a la russe. "Fyodor Fyodorovich Windson”. With his German wife Varvara Bertels, he lived in a wing of the house on Malaya Molchanovka Street. 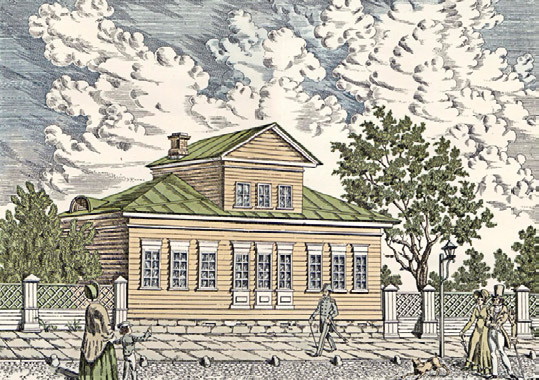 Lermontov spent his youth there (1829-1832), and Windson taught him English, as well as introducing him to the works of British poets and writers. Lermontov’s impressions of Samuel Taylor Coleridge's "The Rime of the Ancient Mariner” were reflected both in his early poems (“Kally”, 1830, “Confession”, 1830, “Boyarin Orsha”, 1836) and in his later works (“Mtsyri”, 1839, “Demon”, 1839), as well as in his novel “A Hero of our time” (1840). In all of these works, romantic and realist, a confessional intonation is used. The grave of Ossian exists." 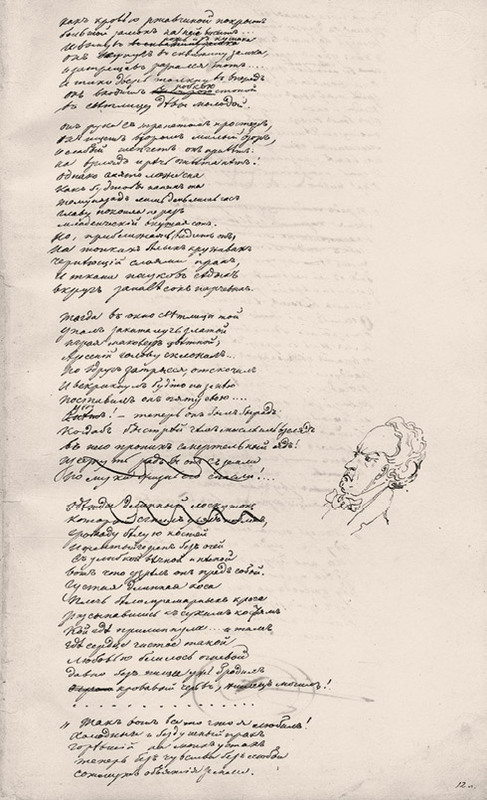 Lermontov’s second cousin Akim Shan-Girei recalled: “Michel began to study English through Byron, and in a few months he could easily understand it; he would read Moore and the poetry of Walter Scott... but he would never speak English fluently.” As a student of Moscow University, Lermontov received the highest grade from the professor of English Philology, Edward Harvey, who supervised him in his literary analysis of excerpts from Walter Scott, Lord Byron and thomas Moore, the irish poet and singer who was Byron’s close friend and later biographer. I wish we could share our lot!.." 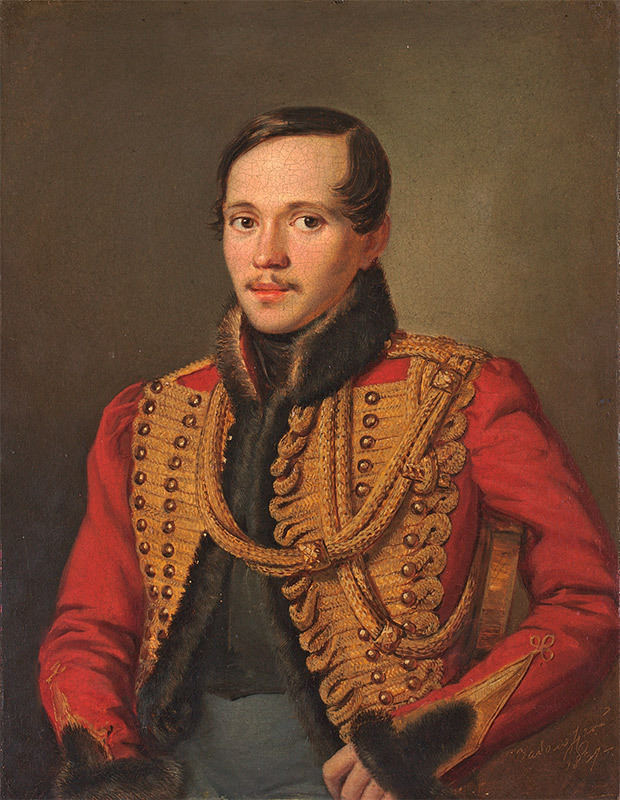 Remarkably, Lermontov’s literary heritage includes two pieces of poetry with English titles, both of them connected with Byron. 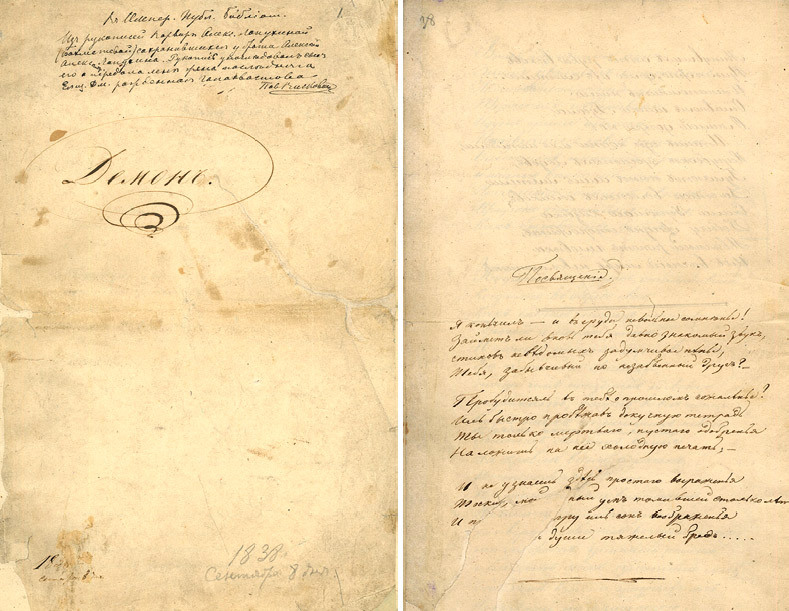 The first is "Farewell” (1830): after the title, in brackets, Lermontov added "after Byron”. "This is not a translation.,” Dostoyevsky later wrote, "like that of Guerbel and others; this is Byron alive, as he is, a proud and impenetrable genius. Lermontov is even more profound here, I think.” The second is "Had we never loved so kindly” (1832), a free translation of a stanza of Robert Burns taken by Byron as an epigraph to his poem "The Bride of Abydos”. I started sooner, sooner ending. 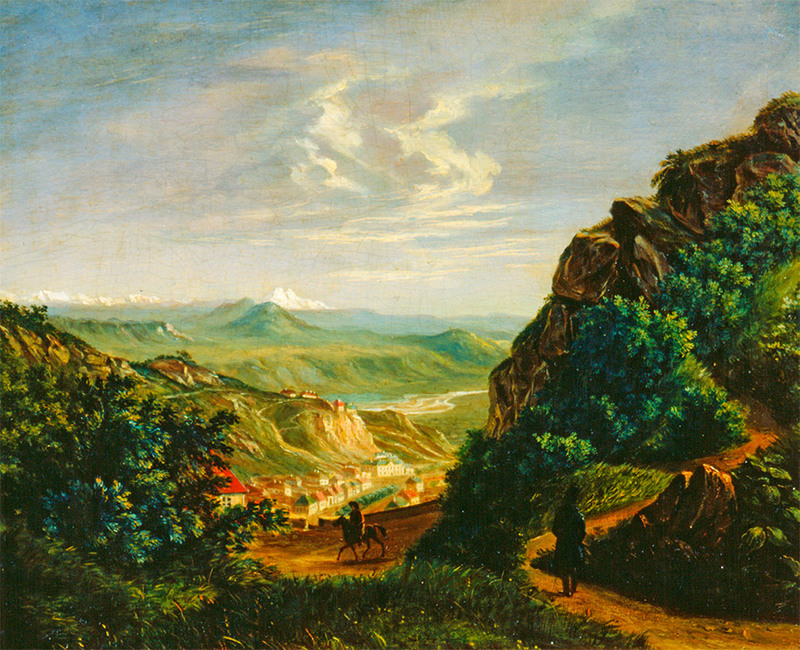 Lermontov had been fond of painting since childhood, and anything which aroused his soul would appear not only in his verse but also in his drawings, watercolours and oil paintings: his subjects included portraits of his friends and relatives, views of the Caucasus and genre scenes, and he particularly enjoyed drawing running horses and “rugged faces”. He painted all his life, but very few of his works have survived: 13 oil paintings, 44 watercolours, about 50 drawings, a few albums with sketches and caricatures, and 70 sketches on the margins of his manuscripts. 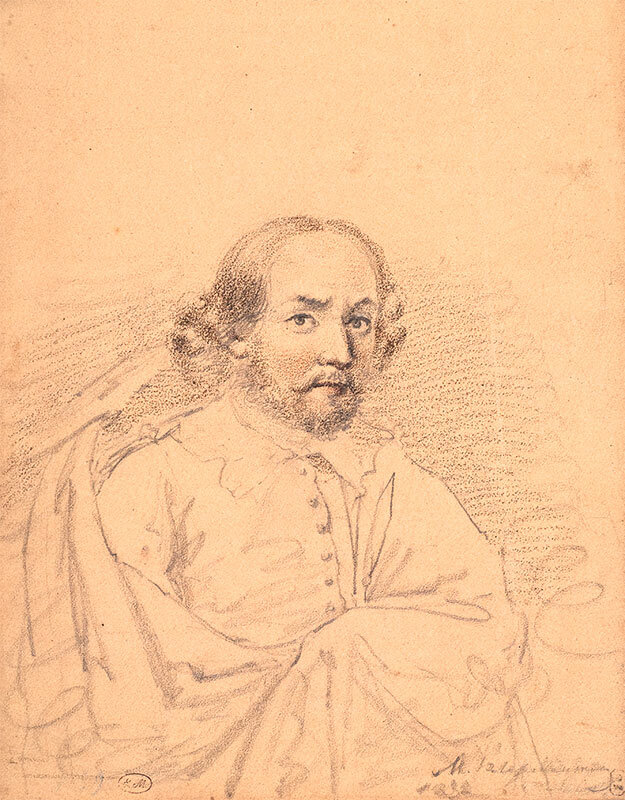 In 1968 the art historian Yevgenia Gavrilova discovered in the collection of the well-known collector and art expert Yegor Makovsky (1800-1886) a drawing which she attributed as a portrait of Shakespeare by Mikhail Lermontov. The portrait is drawn on a thick yellowish sheet of gilt-edged paper with a lead pencil, slightly touched with sanguine. She assumed that the sheet might have been removed from an album: in the bottom right-hand corner there is a barely distinct signature and date, "M.Yu. Lermontov. 1832. [illegible] January”. Gavrilova noted: “Lermontov seems to be taking the image of Shakespeare through the prism of his own perception of the world. Hence the truly romantic style of the portrait - the pose of Shakespeare wrapped in the folds of his coat, a fiery look and the rebellious curve of his brows. 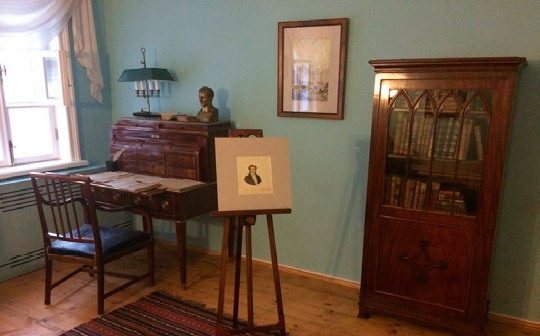 That is the essence of Lermontov’s premise, and an evidently unique approach.” The Lermontov House-Museum in Moscow displays his watercolour self-portrait in a felt cloak, and according to Gavrilova there is a definite similarity to the great playwright. 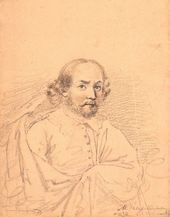 Lermontov maintained a keen interest in Shakespeare throughout his life. Wanting to read again and analyze his works, he wrote to his grandmother in his last letter from Pyatigorsk: “i would also ask for a full collection of Shakespeare, in English, though I’m not sure you can find it in Petersburg; tell Yekim to do it. But please hurry up - if it arrives soon, i may still be here.” There is no evidence as to whether the poet’s grandmother managed to send the collected works in time, and one month later Lermontov was killed in a duel. Soon his works became available to English readers. 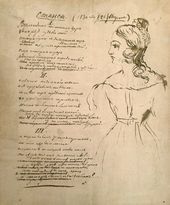 in 1843, thanks to the efforts of the Associate Professor of the imperial Lyceum in Tsarskoe Selo, Thomas Shaw, the Scottish magazine “Blackwood’s Edinburgh” published the first English translation of Lermontov’s verse, titled “The Gifts of the Terek”. The earliest translations of his novel “A Hero of Our Time” date from the 1850s. in 1875 Alexander Condie Stephen made the first translation of “Demon”, and six years later, after the Covent Garden production of Anton Rubinstein’s opera of the same name, the poem ultimately captivated the hearts of the British intelligentsia. 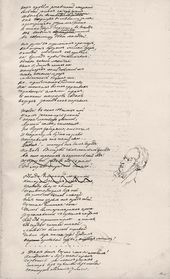 Lermontov’s lyrics were published in Charles Thomas Wilson’s “Russian Lyrics: in English Verse” (London, 1887), and the anthology “Rhymes from the Russian” by John Pollen (London, 1891). in 1899 “A Hero of Our Time” was included in the textbook “A Russian Reader” published in Cambridge. 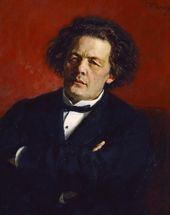 Emigres from Russia also published their translations of Lermontov’s works and wrote articles about him: Alexander Herzen wrote an article, published anonymously, for the London magazine “National Review” (1860) in which he emphasized Lermontov’s role as an iconic figure of his generation, still underestimated. 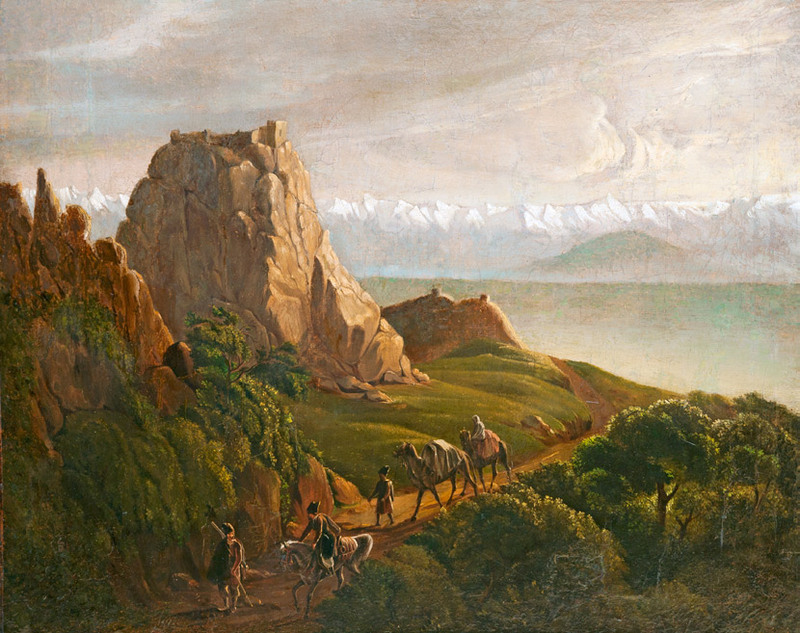 Numerous research works in English dedicated to the poet’s life and work have followed, among the most popular the British author Laurence kelly’s “Lermontov: Tragedy in the Caucasus” (1977). On October 3 2015, the poet’s birthday by the Old Style, a monument to Lermontov, created by the Moscow sculptor Stepan Mokrousov, was unveiled in the old Scottish town of Earlston. The place was selected for its alleged association with Thomas the Rhymer, the legendary 13th century bard who might be an ancestor of the great Russian poet. 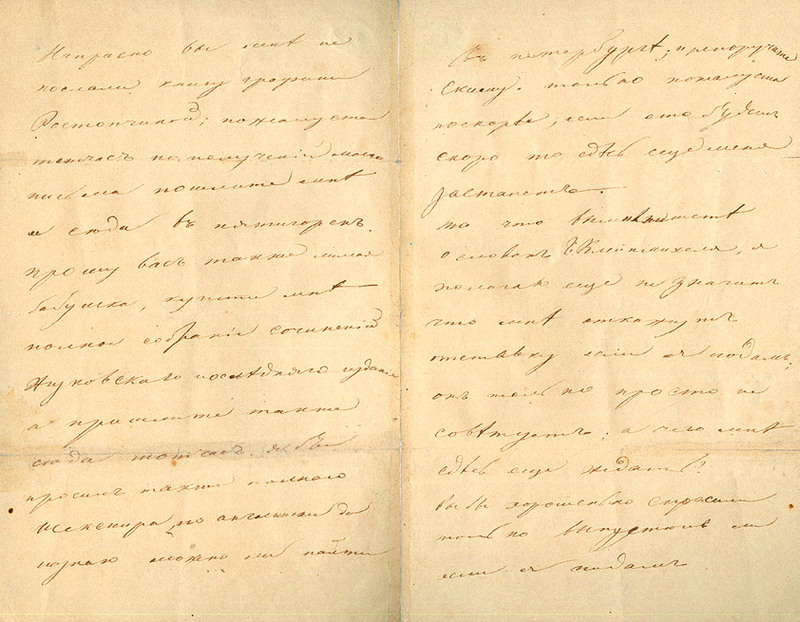 Letter of Mikhail Lermontov to Maria Shan-Girei. [Spring 1829] / “Collected Works”, in 4 volumes. V. 4. St. Petersburg, 2014. P. 313. Ivanova, T.A. “Lermontov in Moscow”. Moscow, 1979. P. 55. 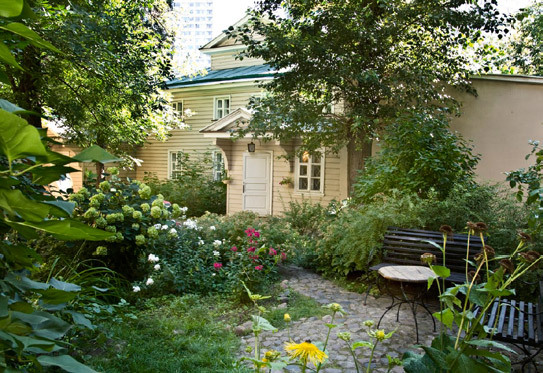 Since 1981 this old mansion has accommodated the Mikhail Lermontov House-Museum. Ivanova, T.A. “Lermontov in Moscow”. Moscow, 1979. P. 57. Lermontov, M.Yu. “Collected Works”, in 4 volumes. V. 1. St. Petersburg, 2014. P. 103. Shan-Girei, A.P. ‘M.Yu. Lermontov’ // “M.Yu. 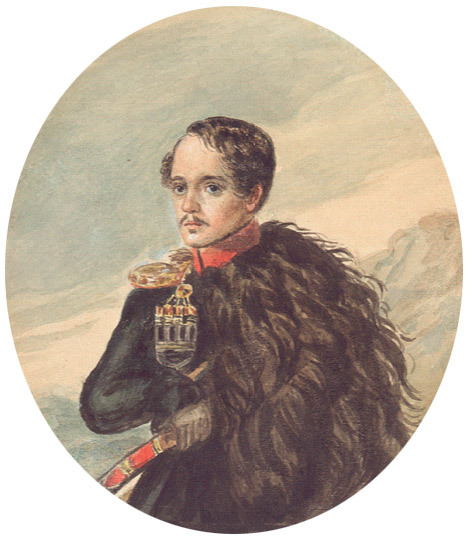 Lermontov in the Memoirs of His Contemporaries”. Moscow, 1964. P.37. Zakharov, V.A. “A Chronicle of M.Yu. Lermontov’s Life and Work”. Moscow, 2003. P. 98. Lermontov, M. Yu. “Collected Works”, in 4 volumes. V. 1. St. Petersburg, 2014. P. 107. Sushkova, Ye.A. ‘The Year 1830. A Chapter from My Notes’ // “M.Yu. Lermontov in the Memoirs of His Contemporaries”. Moscow, 1964. P. 88. Lermontov, M.Yu. ‘Autobiographical Notes’ // “Collected Works”, in 4 volumes. V. 1. St. Petersburg, 2014. P.305-307. Lermontov, M. Yu. “Collected Works”, in 4 volumes. V. 1. St. Petersburg, 2014. P. 448. Viskovaty, P.A. “Mikhail Yuryevich Lermontov. Life and Work”. Moscow, 1989. P.8. 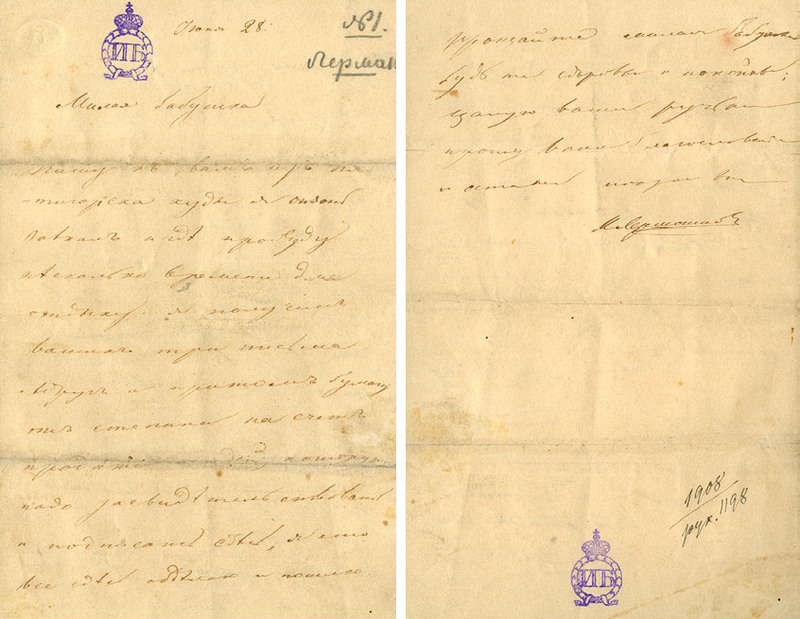 Letter of Mikhail Lermontov to Maria Shan-Girei. [February, 1830 or February, 1831] // “Collected Works”, in 4 volumes. V. 1. St. Petersburg, 2014. P. 314. Currently, this portrait is at the Russian Museum in St. Petersburg. Gavrilova, Ye.I. ‘The Portrait of Shakespeare by Lermontov’ // “The Lermontov Collection”. Leningrad, 1985. P. 248-249. Letter of Mikhail Lermontov to Ye.A. Arsenyeva. [28 June, 1841] // “Collected Works”, in 4 volumes. V. 1. St. Petersburg, 2014. P. 360. 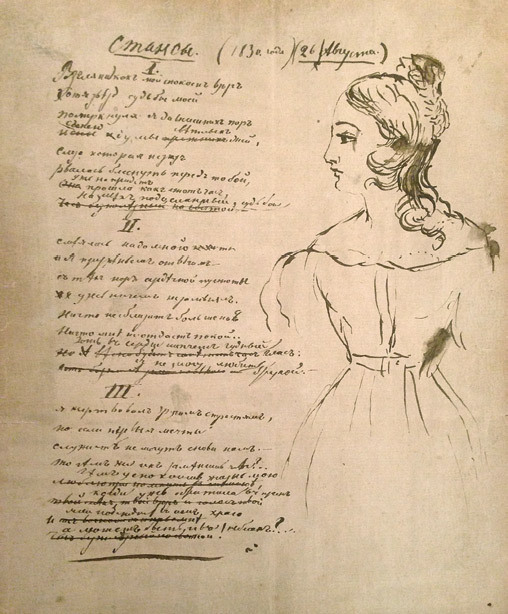 Mikhail Lermontov’s autograph manuscript of the poem “Stanza”, with a portrait of Yekaterina Sushkova. 1830-1831.